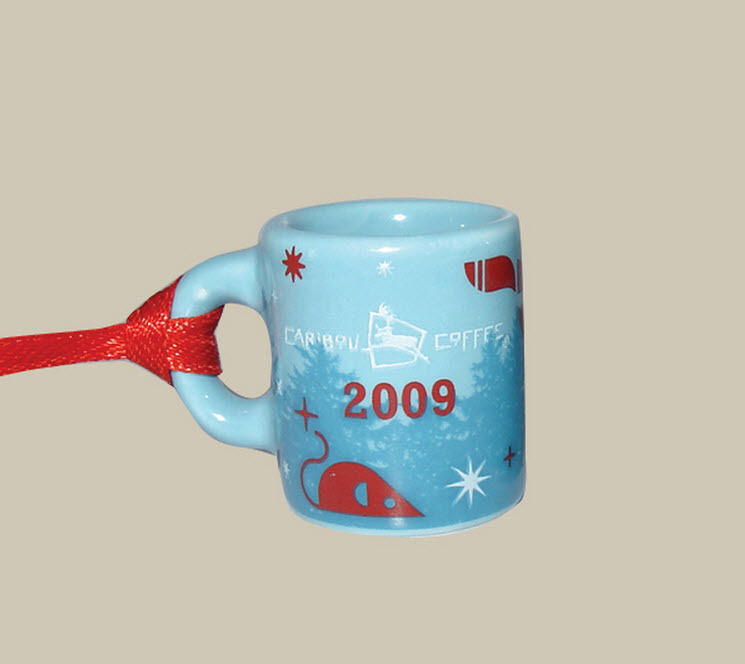 Let me show you 2005 thru 2009 Caribou Coffee Ornaments. They really have some of the cutest I’ve ever seen. Each year they have a lot of handcrafted items. The ornaments started in store around 2005. I have contacted Caribou Coffee and they were unable to tell me when the first issue was, which I was a bit surprised by. So off a searching I went. 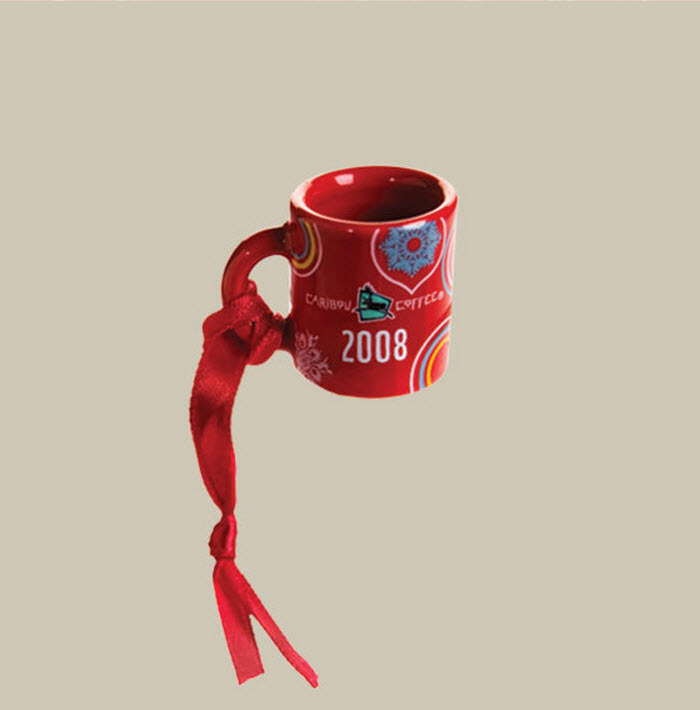 2005 Cup-O-Cheer Mini Mug with ‘Bou Flake. 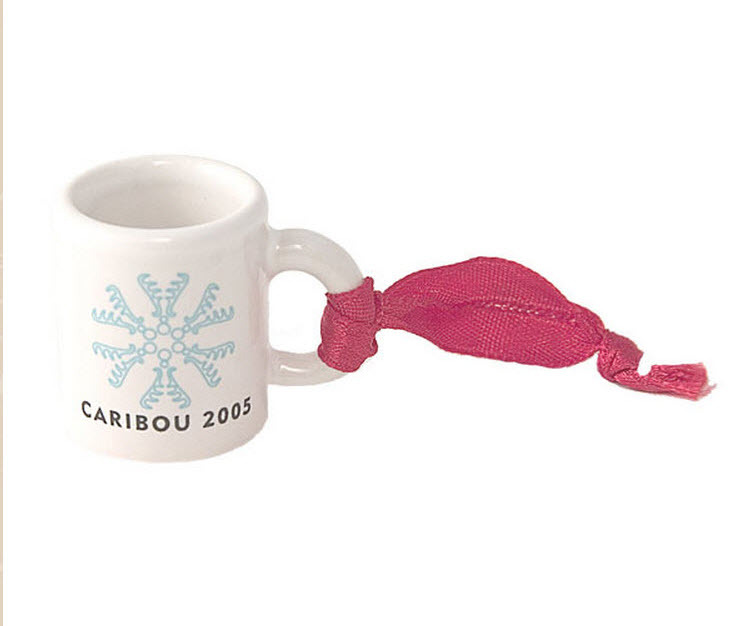 What better way then to present a Caribou Card? 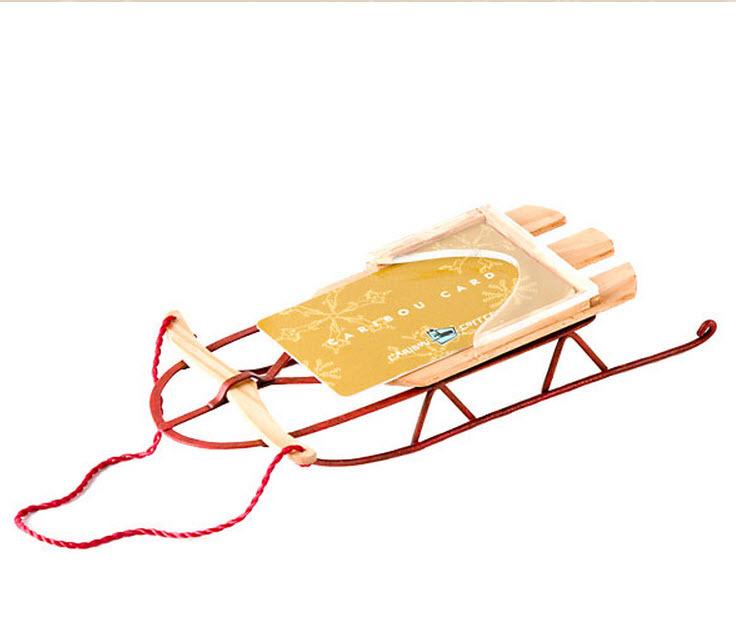 But on a Sled Ornament. I love when a gift card holder is also an ornament. This extremely rare and hard to find. 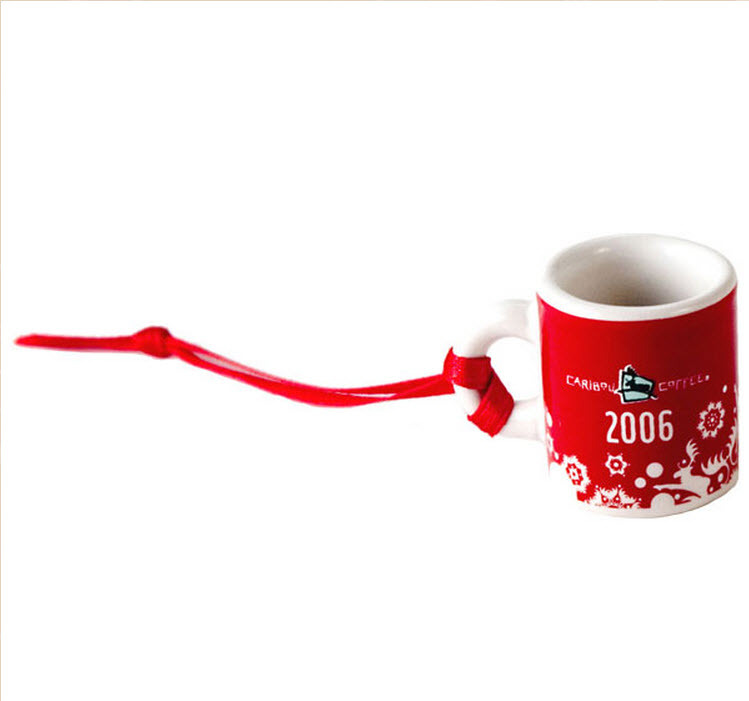 Red ceramic mini mug adorned with snowflake ornaments and circles. I recently purchased these on Ebay knowing I could get to the bottom of what year they were released. 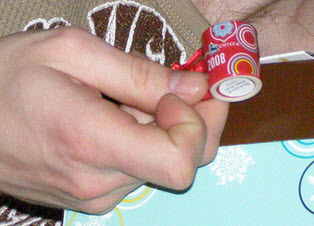 After being in touch with my contacts at Mosquito Inc, I have confirmed the date of release is 2008/2009 holiday season. Let me tell you, this company really knows how to reach into the minds of consumers and know what they expect of a brand and a company. Their quality is superb and the designs are gorgeous. 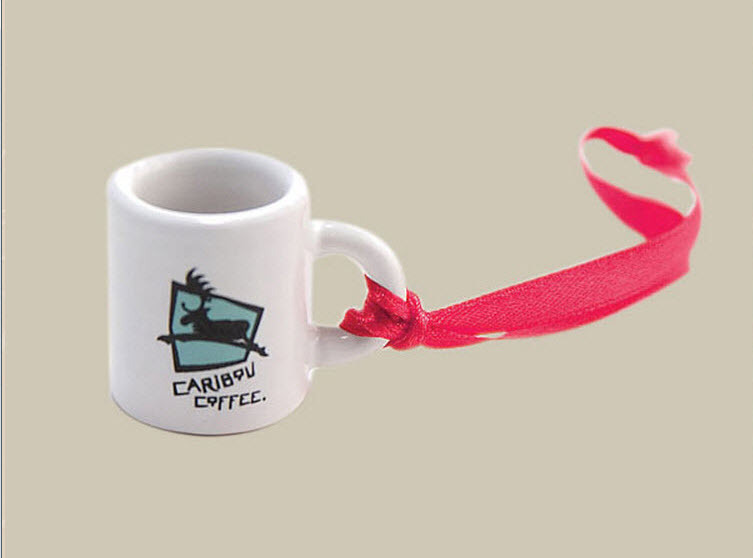 I hope Caribou continues to work with Mosquito Inc in the years to come, because they do not disappoint. Take a look at the 2011 & 2016 they were also responsible for design and manufacturing of each. This is a styrofoam ball covered in a red, yellow, and orange knit sweater pattern with yellow knit hanger. It’s a fun cheery ornament although it is quite large as you can see in my tree photo next to an average sized glass ball. I have had this owl in my unknown list for the last 2 years. So when I saw the Knit Ball, I knew they belonged together. I was relieved to finally find this darling owl its right place in the list. He is stuffed in the same red, yellow, and orange knit sweater pattern but with a red knit hanger. 2 button eyes and adorable orange feet. Out of all the items in 2005-2009, These Ornaments I think are the most collectible. Because they are so small and repurposed like the gift card holder, they can easily be lost and discarded if not knowing what it is.